Arizona Penstemon is a member of the Snapdragon or Figwort Family. The plant grows to 4 feet in height and has broad green, triangular leaves that grow completely around the stem to 3 inches in length. The plant typically grows along roads and on hillsides and canyons at elevations between 2000-7000 feet. 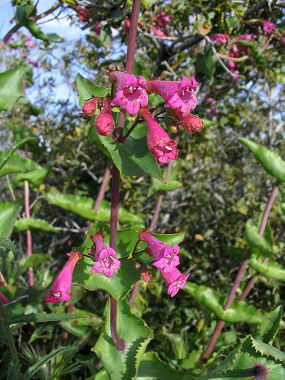 The Arizona Penstemon at right was photographed in the Superstition Wilderness. Arizona Penstemon blooms between February - May and produces a bright purplish-red flowers to 0.75 inches in length that grow in clusters along the stem.